2 lines facing the coaches with 1 player standing upright 3 yards behind the ball. First step with inside foot. Outside arm to midsection of the dummy. Inside arm comes over the top and propel past the dummy. The Defense gets into a 3 point stance and on ball movement, executes their first step, then brings their outside arm to the midsection of the dummy, then bring their inside arm over the top and propel themselves to the offensive player where they execute a form tackle. Note: All movements are half speed until the coach is satisfied with the players form. Once satisfied with Step #2, repeat going full speed. 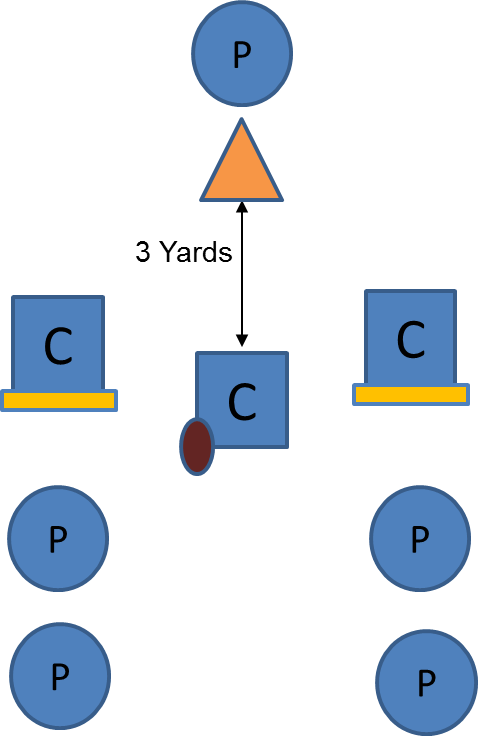 Note: Switch out the player in the backfield every 5 to 6 reps.
For additional drill ideas for your team, we encourage you to download the CLYFL Youth Football Drill Book, as well as visit our YouTube library of football drills. Our library includes drills for Offense, Defense, and Special Teams. We have even included some Flag Football drills.